The overall growth rate of that business. The BCG model proposes that for each business activity within the corporate portfolio, a separate strategy must be developed depending on its location in a two by-two portfolio matrix of high and low segments on each of the above mentioned axes. Relative Market Share is stressed on the assumption that the relative competitive position of the company would determine the rate at which the business generates cash. An organization with a higher relative share of the market compared to its competitors will have higher profit margins and therefore higher cash flows. Relative Market Share is defined as the market share of the relevant business divided by the market share of its largest competitor. Thus, if Company X has 10 per cent, Company Y has 20 per cent, and Company Z has 60 per cent share of the market, then X’s Relative Market Share is 1/6m, Y’s Relative Market Share is 1/3, and Z’s Relative Market Share 60/20 = 3. Company Z has Company Y as its leading competitor, whereas Companies X and Y have Company Z as their lead competitor. The selection of the Rate of Growth of the associated industry is based on the understanding that an industrial segment with high growth rate would facilitate expansion of the operations of the participating company. It will also be relatively easier for the company to increase its market share, and have profitable investment opportunities. High growth rate business provides opportunities to plough back earned cash into the business and further enhance the return on investment. The fast growing business, however, demands more cash to finance its growth. If an industrial sector is not growing, it would be more difficult for the participating company to have profitable investments in that sector. In a slow growth business, increase in the market share of a company would generally come from corresponding reduction in the competitors’ market share. The businesses with low growth rate and high market share are classified in this quadrant. High market share leads to high generation of cash and profits. The low rate of growth of the business implies that the cash demand for the business would be low. Thus, Cash Cows normally generate large cash surpluses. Cows can be ‘milked’ for cash to help to provide cash required for running other diverse operations of the company. Cash Cows provide the financial base for the company. These businesses have superior market position and invariably low costs. But, in terms of their future potential, one must keep in mind that these are mature businesses with low growth rate. If the business growth rate is low and the company’s relative market share is also low, the business is classified as DOG. The low market share normally also means poor profits. As the growth rate is also low, attempts to increase market share would demand prohibitive investments. Thus, the cash required to maintain a competitive position often exceeds the cash generated, and there is a net negative cash flow. Under such circumstances, the strategic solution is to either liquidate, or if possible harvest or divest the DOG business. 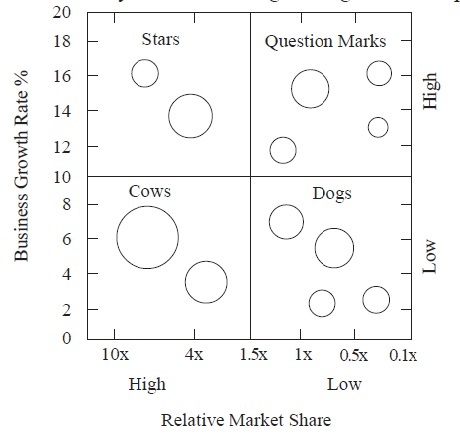 Like Dogs, Question Marks are businesses with low market share but the businesses have a high growth rate. Because of their high growth, the cash requirement is high, but due to their low market share, the cash generated is also low. As the business growth rate is high, one strategic option is to invest more to gain market share, pushing from low share to high. The Question Mark business then moves to a STAR (discussed later) quadrant, and subsequently has the potential to become cash low, when the business growth rate reduces to a lower level. Another strategic option is when the company cannot improve its low competitive position (represented by low market share). The management may then decide to divest the Question Mark business. These businesses are called Question Marks because they raise the question as to whether more money should be invested in them to improve their relative market share and profitability, or they should be divested and dropped from the portfolio. Businesses which have high growth rate and high market share, are called Stars. Such businesses generate as well as use large amounts of cash. The Stars generate high profits and represent the best investment opportunities for growth. The best strategy regarding Stars is to make the necessary investments and consolidate the company’s high relative competitive position. The Boston Consulting Group suggests the following step-by-step procedure to develop the business portfolio matrix and identify the appropriate strategies for different businesses. Classify various activities of the company into different business segments or Strategic Business Units (SBUs). For each business segment determine the growth rate of the market. This is later plotted on a linear scale. Compile the assets employed for each business segment and determine the relative size of the business within the company. Estimate the relative market shares for the different business segments. This is generally plotted on a logarithmic scale. Plot the position of each business on a matrix of business growth rate and relative market share. Most companies will have different segments scattered across the four quadrants of BCG matrix, corresponding to Cash Cow, Dog, Question Mark and Star businesses. The general strategy of a company with diverse portfolio is to maintain its competitive position in the Cash Cows, but avoid over-investing. The surplus cash generated by Cash Cows should be invested first in Star businesses, if they are not self-sufficient, to maintain their relative competitive position. Any surplus cash left with the company may be used for selected Question Mark businesses to gain market share for them. Those businesses with low market share, and which cannot adequately be funded, may be considered for divestment. The Dogs are generally considered as the weak segments of the company with limited or now new investments allocated to them. The BCG Growth-share matrix links the industry growth characteristic with the company’s competitive strength (market share), and develops a visual display of the company’s market involvement, thereby indirectly indicating current resource deployment. (The sales to asset ratio is generally stable over time across industries). The underlying logic is that investment is required for growth while maintaining or building market share. But, while doing so, a strong competitive business in an industry with low growth rate will provide surplus cash for deployment elsewhere in the Corporation. Thus, growth uses cash whereas market competitive strength is a potential source of cash. In terms of BCG classification, the cash position of various types of businesses can be visualised as in Table -1. The Growth-share BCG Matrix has certain limitations and weak points which must be kept in mind while using portfolio analysis for developing strategic alternatives. These are now briefly discussed. BCG analysis assumes that profits depend on growth and market share. The attractiveness of an industry may be different from its simple growth rate, and the firm’s competitive position may not be reflected in its market share. Some other sophisticated approaches have been evolved to overcome such limitations. There have been specific research studies which illustrate that the well-managed Dog businesses can also become good cash generators. These organizations relying on high-quality goods, with medium pricing and judicious expenditure on R & D and marketing, can still provide impressive return on investment of above 20 per cent. There is a heavy dependence on the market share of a business as an indicator of its competitive strength. The calculation of market share is strongly influenced by the way the business activity and the total market are defined. For instance, the market for helicopters may encompass all types of helicopters, or only heavy helicopters or only heavy military helicopters. Furthermore, from geographical point of view the market may be defined on worldwide, national or an even regional bases. In case of complex and interdependent industries, it may also be quite difficult to determine the market share based on the sales turnover of the final product only. In the BCG approach, businesses in each of the different quadrants are viewed independently for strategic purposes. Thus, Dogs are to be liquidated or divested. But, within the framework of the overall corporation, useful experiences and skills can be acquired by operating low-profit Dog businesses which may help in lowering the costs of Star or Cash Cow businesses. And this may contribute to higher corporate profits. The BCG analysis, while considering different businesses does not take into consideration the human aspects of running an organization. Cash generated within a business unit may come to be symbolically associated with the power of the concerned manager. As such managing a Cash Cow business may be reluctant to part with the surplus cash generated by his unit. Similarly, the workers of a Dog business which has been decided to be divested may react strongly against changes in the ownership. They may deem the divestiture as a threat to their livelihood or security. Thus, BCG analysis could throw up strategic options which may or may not be easy to implement. It was in 1981 that the Boston Consulting Group realised the limitations of equating market share with the competitive strength of the company. They have admitted that the calculation of market share is strongly influenced by the way business activity and the total market domain are defined. A broadly defined market will give lower market share, whereas a narrow market definition will result in higher market share resulting in the company as the leader. It was, therefore, recommended that products should be regrouped according to the manufacturing process to highlight the economies of scale manufacturing, instead of stressing the market leadership. On the other hand, BCG still maintain that for branded goods it is important to be the market leader so that the advantages of economies of scale and price leadership can be fully utilised. But they also concede that such advantages may still be achieved even if the company is not the largest producer in the industry. Some other versions of portfolio analysis have however developed much beyond these minor modifications of BCG analysis.